In addition, MC Glass Art Inc. offers interior designers, architects, art consultants, and corporate clients highly personalized custom orders and exclusive artwork. If you’re looking for special orders for your art collection or business, please contact us today and give us an opportunity to create that magnificent piece you’re looking for. Hung Nguyen was born in Hoa Binh, Vietnam in 1959, at the beginning of the Vietnam war. He is the second child in a family of six. After the war in 1975, the country was left in a turbulent state. At the age of 22, he escaped from Vietnam on dangerous crude and overcrowded boat to seek for freedom and opportunities to express himself through art. He arrived in the United States in 1981 as a refugee. Clearly, Hung developed a natural talent for glass art making and designing. 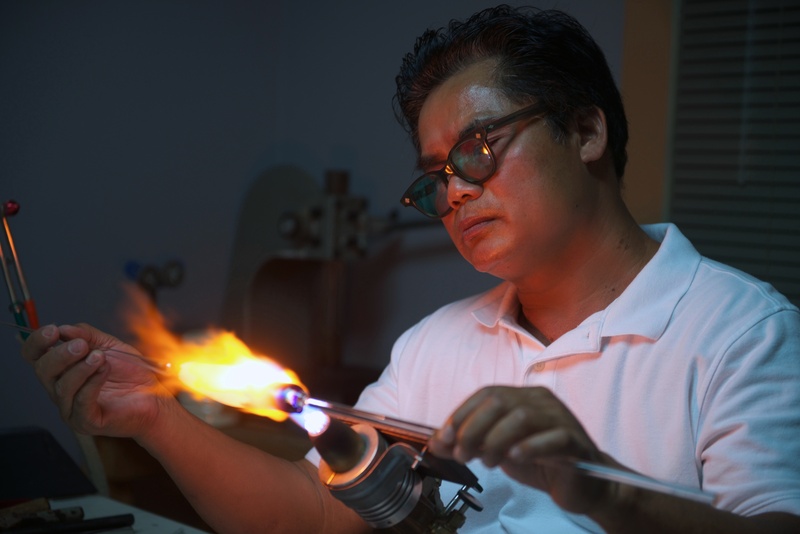 For over 27 years, Nguyen has been recognized for his exceptional skills in creating outstanding glass art pieces and earned him the title of Master of Glass Art. His genuine work of art is in the hands of the world’s most famous people such as President George Bush, Mikhail Gorbachev, Sean “Diddy” Combs, Wayne Newton and Larry King. Hung’s passion for the simple elegance and beauty of Georgia’s state flowers placed several of his sculptures at exhibition places like the Atlanta Botanical Garden, the University of Georgia State Botanical Garden of Georgia, and McKee Botanical Garden in Vero Beach, Florida. In addition, his abstract and creative sculptures landed him opportunity to place his intrepid glass sculptures on Crystal Fox Gallery as well as to create custom excellence award for many companies.